In Kuwait, American forces are stacked up, locked and loaded for the invasion of Iraq. In Paris, a covert agent, a woman who inhabits a twilight of lies and death, is close to cracking a terrorist cell. And just north of the equator, a forty-foot wood-hulled sailboat, manned by a drug runner, a pirate, and two gun-slinging beauties, is witness to the unspeakable. In one instant, all around the world, for politicians and peasants, from Gaza to Geneva, things will never be the same. A wave of inexplicable energy has slammed into the continental United States. America, as we know it, is gone. 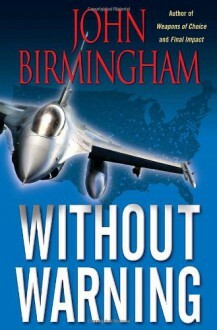 . . .WITHOUT WARNINGNow U.S. soldiers are fighting a war without command or control. A correspondent records horrors for no one. Washington is gone and the line of succession is in tatters; the functioning remnants of government are in Pearl Harbor, Guantánamo Bay, and one desperate, isolated corner of the Northwest. For the jihadists, it’s Allah’s miracle. For Saddam, it’s a chance to attack. Iran declares war on an America that doesn’t exist–except in the hearts and souls of the men and women who want it to.In this astounding work of alternate fiction, John Birmingham hurtles us into a scenario that is unimaginable but shatteringly real: a world of financial ruin where a cloud of noxious waste–from America’s burning cities–darkens Europe, while men and women in offices around the globe struggle to make decisions that cannot hold and opportunists unleash their secret demons.From a slick Texas lawyer who happens to be in the right place at the right time to a hard-working city engineer in Seattle who becomes his terrified city’s only hope, from the cancer-stricken secret agent to a drug runner off the Mexican coast and a U.S. general in Cuba, Without Warning tells a fast, furious story of survival, violence, and a new, soul-shattering reality. The first in an epic trilogy that will leave readers breathless and astounded, Without Warning offers a world without its policeman, its Great Satan, or its savior–as an unknowable future struggles to be born. I enjoyed this book. Great 'what if' disaster scenario played out. Going to go get the rest of the series for my Nook at B&N.